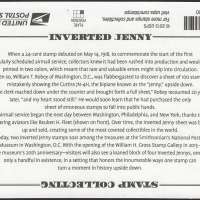 WASHINGTON — In a move to celebrate the grand opening of the William H. Gross Gallery at the Smithsonian National Postal Museum and promote October as National Stamp Collecting Month, the Postal Service dedicated a new $2 version of the most publicized stamp error in U.S. history today — the 24-cent 1918 Curtiss Jenny Inverted airmail stamp. Two eerie occurrences took place surrounding the nation’s first airmail flight. The pilot got lost, flew in the wrong direction and crashed. 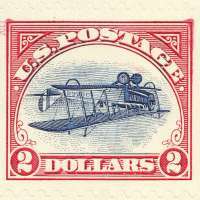 And due to a printing error of the stamp created to commemorate this historic event, the biplane depicted on the 24-cent Curtiss Jenny airmail stamp was upside down. A sheet of 100 stamps bearing this error was sold to the public. One stamp sold at auction in 2007 for $977,500. Pan Am, TWA, American, United, Northwest and other airlines originated as air mail contractors before passenger service began. Additionally to help commercial aviation get off the ground and to speed the mail, the Post Office Department helped develop navigational aids such as beacons and air-to-ground radio. Today the Postal Service continues as the commercial aviation industry’s largest freight customer. Mail also flies on FedEx and UPS cargo aircraft. Joining Donahoe in dedicating the souvenir sheet were NASA Mission Operations and Data Analysis Program Executive Dr. Jeffrey Hayes; Smithsonian’s National Postal Museum Director Allen Kane; National Postal Museum William H. Gross Gallery Lead Curator Dr. Cheryl Ganz; and William H. Gross Gallery Curator Daniel Piazza. In 1918, in a rush to celebrate the first airmail flight, the Post Office department issued the 24-cent Curtiss Jenny stamp. Because the design required two colors, sheets were placed on the printing press twice — first to apply red ink and a second time to apply blue ink. This process was given to human error — as stamp collectors at the time well knew. 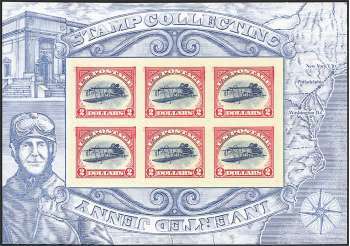 A Washington, DC, Post Office clerk — who had never seen an airplane — sold a sheet of 100 stamps mistakenly showing the biplane upside down. For nearly a century, stamp collectors have chased the Inverted Jennys and have accounted for nearly all 100 of them.